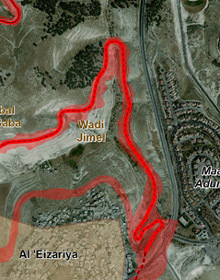 The Wadi Jimel community is located west of Ma’ale Adumim and north of Al-E’izariya, west of the separation barrier’s course and outside of the Ma’ale Adumim enclave. The community arrived at Wadi Jimel in the mid-1960s, after having been evacuated from the Tel Arad area in the Negev, and lived for a number of years in the vicinity of Bethlehem. Upon arriving in the area, they chose Wadi Jimel because of the grazing lands that were available at the time, and the convenient access to three local springs. They settled on private lands with the agreement of the landowners, residents of Al-E’izariya. According to the residents, some of them even bought lands, approximately 1.5 hectares, from residents of Al-E’izariya, and have documents attesting to the transactions. The residents live in the river channel, into which water streams in the winter season, and it is therefore a green place where cultivation is impossible due to the strong current there in winter. 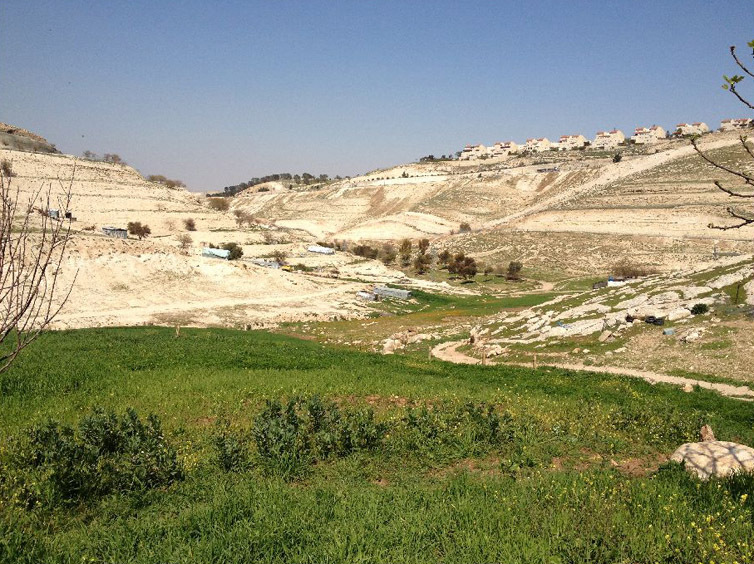 The community is located outside both the jurisdictional area of Ma’ale Adumim, and the boundaries of the E1 plan. There is testimony regarding the continuous building and residence there, at least since the beginning of the 1970s, and there was significant growth in construction in the first decade at the turn of the millennium. The houses are all built of light materials – wood, tin, fabric and plastic. At the beginning of the 1990s, demolition orders were issued for several of them, but these were not implemented, and later, in 1997, one house was demolished, together with an adjacent olive orchard, even though it was built on private land. According to the residents, since then, no demolition orders have been issued in the community, no homes have been demolished, and the Civil Administration does not interfere in all that pertains to the improvement and upkeep of the homes. 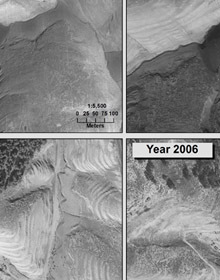 The planned course of the separation fence passes near the community to the north, and seizure orders were issued for these lands in 2005. The separation barrier blocks traffic to the northwest, and not only does it limit possibilities for movement and access to the grazing lands – it also separates the community from Al-E’izariya, making it very difficult to conduct daily affairs in the main center for civilian services. The limitations on movement have also reduced the options for water access. Today, residents can only reach one water source relative to three in the past, and in addition, they are forced to use water tanks and a water pipe leading from Al-E’izariya that residents hooked up independently. 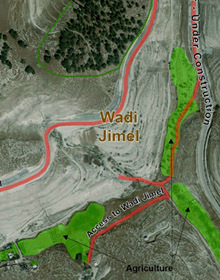 The main difficulty in raising flocks in Wadi Jimel is the lack of sufficient access to grazing areas. In the past, residents received assistance in the form of feed from foreign organizations via the Palestinian Authority, but supply was irregular. The flocks serve for the manufacture of milk products for home consumption and also for a certain amount of commercial sales, and the residents attempt to market and sell their products in East Jerusalem neighborhoods. Some 30% of the residents rely on additional sources of income, and work in construction in the settlements, in the Mishor Adumim industrial area, in Palestinian companies and in the offices of the Palestinian Authority. And yet, the unemployment rate can be as high as 50%, mainly during periods when work permits for work in the settlements are not being distributed. The women rarely leave the boundaries of the locality, and do not bring in an outside income. Due to their location in the wadi at the base of the mountain, the residents encounter problems of flash floods following the rains, and remedying this, they claim, is one of their urgent needs at this location.